To some of his contemporaries, Blanski’s conversion may look like nothing more than an abandonment of authenticity and autonomy for a life of bland conformity. Now a Catholic for four years, he’s found the opposite to be true. “Catholicism, as foreboding and frustrating as it might look like from the outside, actually is freedom,” he said. The book, which took a year to write, blends theological insights with a compelling story. Themes like the sacraments, Mary and the papacy coincide organically with chapters of Blanski’s life, from his teenage days rebelling against the Twin Cities Baptist megachurch his family attended, to his poetry-infused undergraduate studies at Hillsdale College in Michigan, and finally to the climax of his conversion as an Anglican at Nashotah House Theological Seminary outside Milwaukee, Wisconsin. Along the way, Blanski weaves in the music he was listening to, the books he was reading and the conversations he was having, creating a narrative that engages the reader’s imagination and intellect. And they freely admit that it hasn’t always been an easy ride. For one, the couple’s openness to life has meant sacrifices for the sake of new responsibilities. With children Timothy, 4, and June, 2, and a new business occupying much of their time and energy, the over 1,000 books that line an entire wall of the Blanskis’ home have largely gone untouched since the family moved back to Minnesota in February. The epiphanies of their early years as Catholics have been replaced by the struggle of taking two young children to Mass. 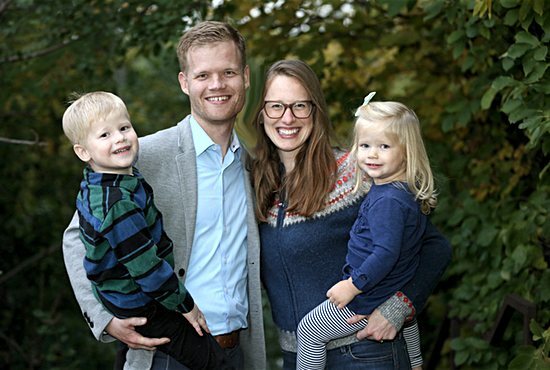 Blanski’s status as a millennial convert, as well as his position leading ministry at a Wisconsin parish for four years after his conversion, has given him some insight into how the Church can reach young people in the present moment, the theme of the Synod of Bishops underway at the Vatican. He says effective evangelization begins with conviction. In a world of disenchantment, the Blanskis said it’s all the more critical for the Church to be reverent and beautiful at its core: in the Mass. Concerned that perhaps they had developed a superficial attachment to incense, altar bells and other things associated with more traditional worship when they converted, they took a step back from those kinds of liturgies — only to find that they were missing something vital.